The Cumulus Exporter exports metadata from your Canto Cumulus catalogs. The export files can be used to prepare Cumulus metadata for other database solutions (i.e. inventory systems, PIMS, CMS, CRM, etc.) or the export files can be opened in Microsoft Excel. It is also allows you to export the Cumulus Thumbnail images as JPEG files. All records in the current Cumulus collection will be exported. You can specify the fields that you want to export from the catalog. 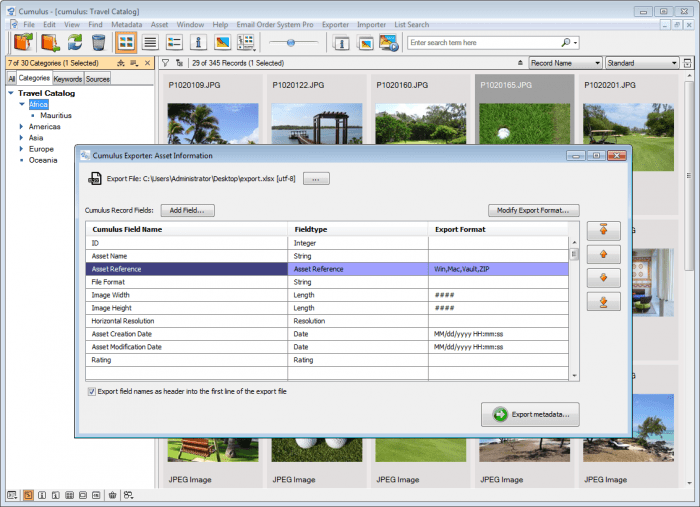 The Cumulus Exporter allows to choose the export formatting for most of the Cumulus field types and converts the metadata during export. The metadata can be exported into files of type Text (.txt) or CSV (‘Comma-Separated Values format’, .csv) or Microsoft Excel file format (.xls or .xlsx). You can specify the encoding of the export and also how to treat Cumulus NULL values (fields without a value). The list of selected export fields, the assigned formatting to each of the fields and all the current software settings can be saved in an export scheme file, which you can use again for your next export or load the settings as a start for another export configuration. A export menu allows to immediately start a scheme export without bringing up any additional configuration dialogs, which makes the export of different sets of metadata really comfortable. A log file is created for each export process, which provides information about the progress and contains messages and errors. Contact us to learn more about Cumulus Exporter.